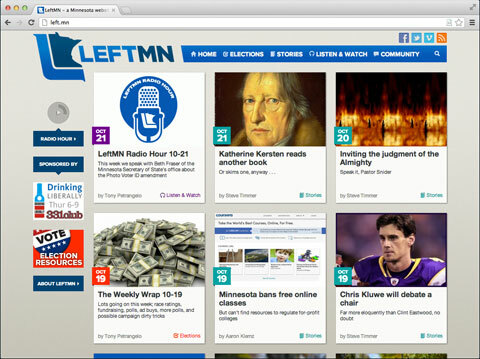 LeftMN is Minnesota’s freshest political news site focusing on state-level politics and covering the news with a decidedly liberal bias. Early this year I was approached by friend and activist Tony Petrangelo to help him design and develop a news site where he could house all his poll analysis, as well as include editorials, video and audio produced by himself and fellow bloggers Steve Timmer and Aaron Klemz. Since the launch in May, the site has grown to include additional bloggers as well as a weekly podcast and radio show that airs on AM950. If you enjoy good political analysis and journalism as well as the occasional scathing editorial skewering right-wing public figures, check out LeftMN.